The work in this paper is about to detect and classify jamming attacks in 802.11b wireless networks. 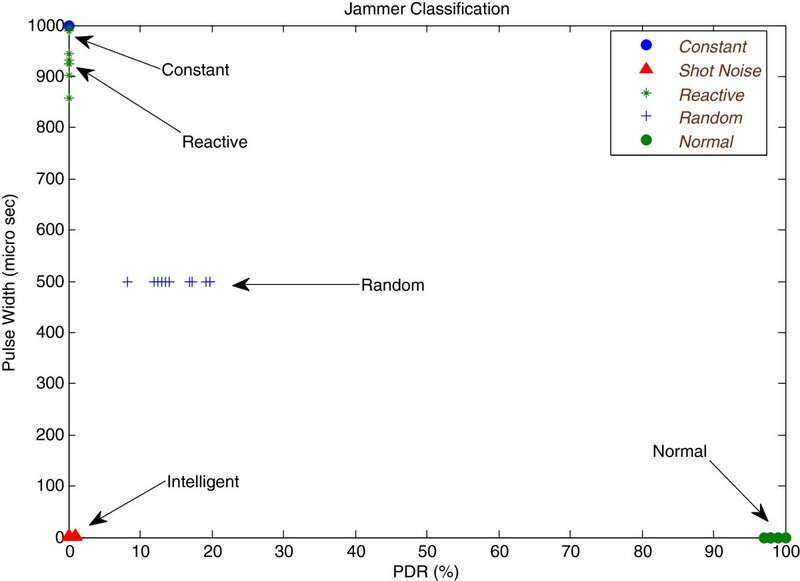 The number of jamming detection and classification techniques has been proposed in the literature. Majority of them model individual parameters like signal strength, carrier sensing time, and packet delivery ratio to detect the presence of a jammer and to classify the jamming attacks. The demonstrated results by the authors are often overlapping as most of the jamming regions are closely marked, and they do not help to clearly distinguish different jamming mechanisms. 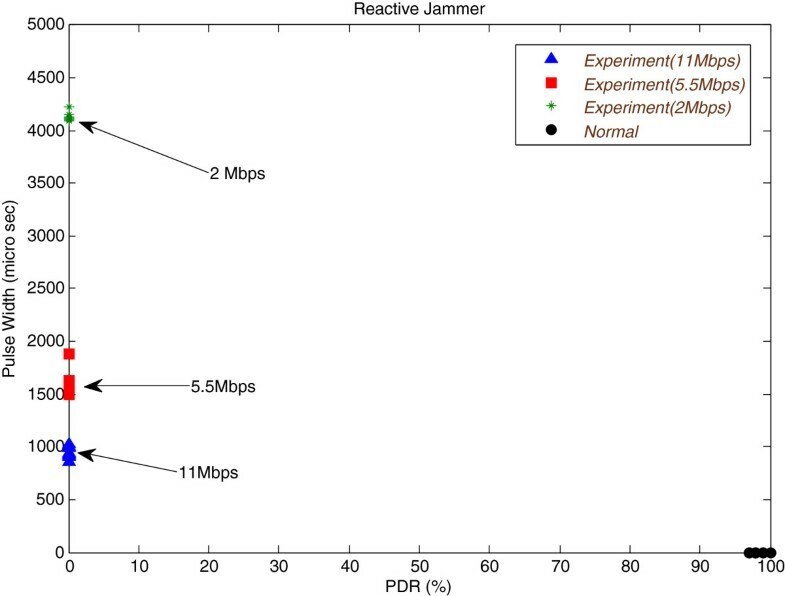 We investigate a multi-modal scheme that models different jamming attacks by discovering the correlation between three parameters: packet delivery ratio, signal strength variation, and pulse width of the received signal. Based on that, profiles are generated in normal scenarios during training sessions which are then compared with test sessions to detect and classify jamming attacks. Our proposed model helps in clearly differentiating the jammed regions for various types of jamming attacks. In addition, it is equally effective for both the protocol-aware and protocol-unaware jammers. The reported results are not based on simulations, but a test-bed was established to experiment real scenarios demonstrating significant enhancements in previous results reported in the literature. Wireless networks make use of shared transmission medium; therefore, they are open to several malicious attacks. An attacker with a radio transceiver intercepts a transmission, injects spurious packets, and blocks or jams the legitimate transmission. Jammers disrupt the wireless communication by generating high-power noise across the entire bandwidth near the transmitting and receiving nodes. Since jamming attacks drastically degrade the performance of wireless networks, some effective mechanisms are required to detect their presence and to avoid them. Constant, deceptive, reactive, intelligent, and random jammers are few jamming techniques used in wireless medium. All of them can partially or fully jam the link at varying level of detection probabilities. Accurate detection of radio jamming attacks is challenging in mission critical scenarios. Many detection techniques have been proposed in the literature, but the precision component is always an issue. Some of them either produce high false alarm rates or do partial detection of jamming attacks. Moreover, the results are based on simulations [1–7]. After detection, classification of jamming attacks is necessary to launch appropriate recovery techniques like channel hopping or spatial retreat. The classification of jamming attacks plays an important role not only to differentiate them from each other but also to identify different network performance degradation phenomena like network congestion or channel fading. As earlier said, the reported work in the literature mainly focus on the classification of jamming attacks based on packet delivery ratio (PDR), signal strength (SS), or carrier sensing time (CST) individually. Accurate detection of jamming attacks based on single detection parameter is not too accurate . Various models based on two parameters have been proposed [1, 3–5]. The detection of jamming based on PDR in consistence with signal strength and location is discussed in . Authors in  identified jammed and non-jammed regions, but they did not distinguish different types of jamming attacks. In , a drop in PDR is checked by considering the correlation coefficient between error and correct reception time, but that works for reactive jammers only. Another technique for detection based on fabricated clear-to-send (CTS) packets is discussed in ; however, it is more promising to intelligent jamming. Authors in  observe the deferred transmissions. When PDR drops, the average number of transmission attempts per successful transmission is checked. Then, the decision of jamming or no jamming is taken based on the predefined threshold values. The PDR in corresponding with signal-to-noise ratio (SNR) is checked in , and the presence of a jammer is declared based on predefined threshold values. Authors also use the network throughput for the given number of nodes with fixed transmission probability as a detection parameter. The approach works fine; however, it needs more explanation for the cases when the SNR is low and the network is congested. The jamming detection techniques reported in the literature are of specific types. Authors have mainly worked on a particular jamming attack, and therefore, the classification of different attacks remained relatively less studied. 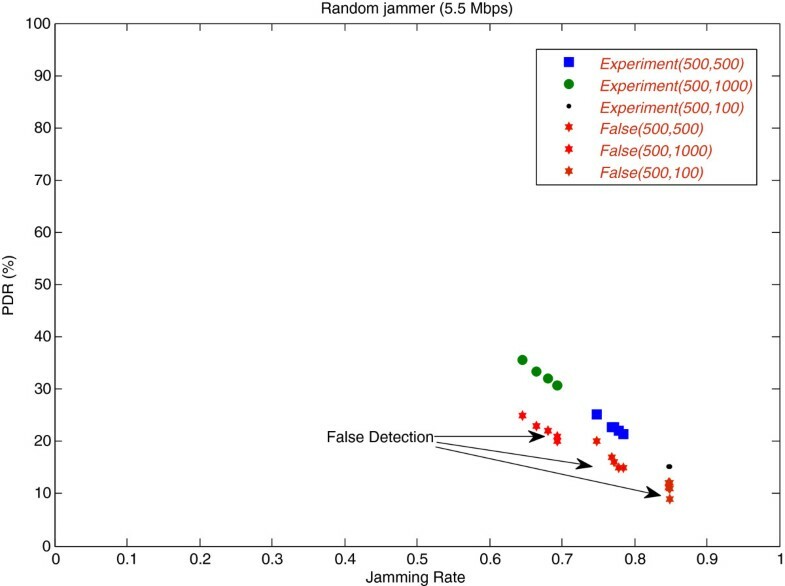 The development of multi-modal detection technique can help in detecting jamming attacks with lower false alarm rate and high precision. In our work, we propose a three-dimensional model based on signal strength, PDR, and pulse width (PW) of the signal resulting in a significant improvement in accuracy and also to classify jamming attacks in a better way. The rest of this article is organized as follows. Section 2 provides relevant definitions, terms, and metrics to characterize the jamming attacks. Section 3 provides a brief summary of previous work done on jamming detection and classification. In Section 4, we explain our proposed model for both the detection and classification of jamming attacks. An analysis on the achieved results is presented in Section 6. Finally, conclusions are drawn in Section 7. This section provides definitions of related parameters and explains types of jamming attacks. It also provides metrics to characterize jamming attacks. It is the ratio of the total number of packets correctly received to the total number of packets received. For an environment with noise and interference, the PDR is measured at the receiver side as the ratio of number of packets received that pass cyclic redundancy check (CRC) to the total number of packets received. 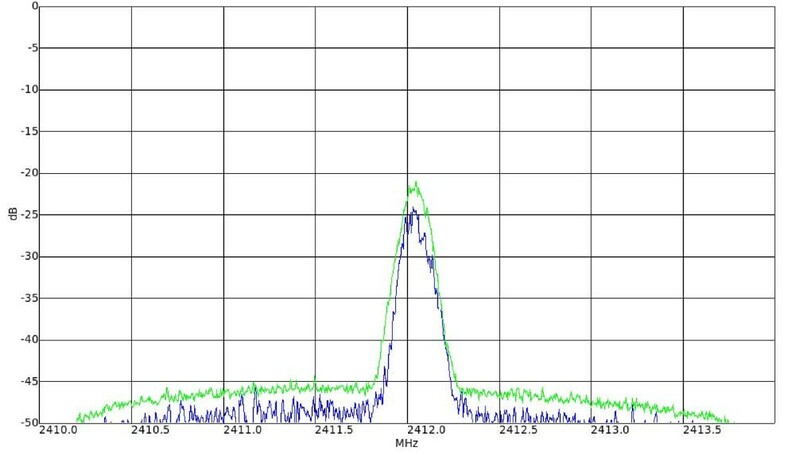 Packet sent ratio (PSR) is measured at the transmitter side. It is the total number of acknowledgments (ACKs) packets received to the total number of packets transmitted. It is the time a station has to wait for the channel to get idle to start its transmission. It is the signal power that is observed on the receiver end. Signal strength can be used as a detection parameter . 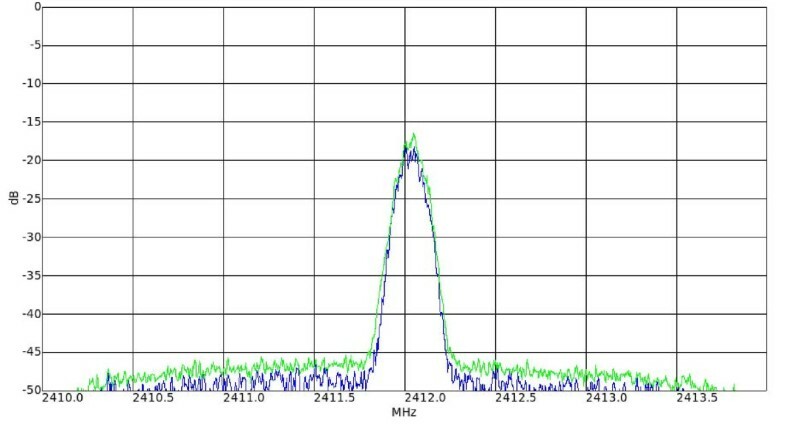 There are two approaches that are used to characterize the variation in signal strength: (1) average value of signal strength in time window and (2) spectral discrimination technique. A constant jammer continuously produces high-power noise that represents random bits. The bit generator does not follow any media access control (MAC) protocol and operates independent of the channel sensing or traffic on the channel. A random jammer operates randomly in both sleep and jam intervals. During sleep interval, it sleeps irrespective of any traffic on the network, and during jam interval, it acts as a constant or reactive jammer. That jammer does not follow any MAC protocol. The PDR increases when the sleep interval increases and the packet size decreases. These jammers continuously send illegitimate packets so that the channel appears busy to the legitimate nodes. They are protocol aware and increase carrier sensing time for the legitimate nodes indefinitely. The difference between a deceptive and a constant jammer is that a constant jammer sends random bits continuously while a deceptive jammer sends packets which appear legitimate to the receiver. A reactive jammer activates when it senses the transmission on the channel. If the channel is idle, it remains dormant and keeps sensing the channel. On sensing the transmission, it transmits enough noise resulting some sufficient number of bits corrupted in the legitimate packet so that packet checksum is not recovered by the receiver and the packet is discarded. Hence, it causes the drop in PDR. Shot noise-based intelligent jammers are protocol-aware jammers that just beat forward error correction (FEC) scheme used at physical and MAC layers . IEEE 802.11b networks use convolutional coding at the physical layer. Single continuous pulse interfering legitimate packet can completely drop it if it is able to beat the FEC scheme used in the packet [7, 9]. The type of metrics also depends on the application in consideration. Energy efficiency is an important metric for all the jammers specifically in jamming the sensor networks for a long time. Strong denial of service is critical in war situations. Least probability of detection is desired for jammers if they have to keep for a long time in opponent areas safely. FEC schemes increase resilience of packet against errors. Strong FEC codes can be compromised with constant or intelligent jamming. PDR, PSR, CST, and SS are important measures to detect jamming attacks. These parameters are influenced by channel fading, network congestion, or link failure. Aforementioned jamming detection techniques have been discussed in . Adaptive threshold like in BMAC protocol is suggested in , but it has the drawback of continuously increasing the transmission power, eventually jammer blasting at channel and detector which shows the channel idle. Two signal strength measurements are taken into consideration. The basic average for energy detection fails for a constant jammer. The technique of spectral discrimination is used which shows that if higher order crossing is used, then it works for constant and deceptive jammers but cannot distinguish random and reactive jammers. CST is taken as another measure that is the time a node has to wait for the channel to start its transmission. It is observed that under network congestion, the CST is greater than those of random and reactive jammers. Another detection strategy using PDR with two consistency checks, i.e., signal strength consistency check and location consistency check (LCC), is proposed in . If signal strength is higher, then PDR must be high while converse is not true. In case of LCC, an assumption is taken that all nodes in the network have their neighborhood information from their upper routing layer. If a node observes low PDR, it compares it with that of its neighbor and decides whether the channel is jammed or not. Moreover, the neighboring nodes have to pass the location and update messages periodically about their new location. This is communication overhead. The effectiveness of methods in  is based on the analysis of the large amount of data collected in all possible scenarios. Thus, they are not designed as real-time methods. Another disadvantage is that the jamming detection method and countermeasure are separately considered so that the problems are simplified, but the network performances are not optimized. 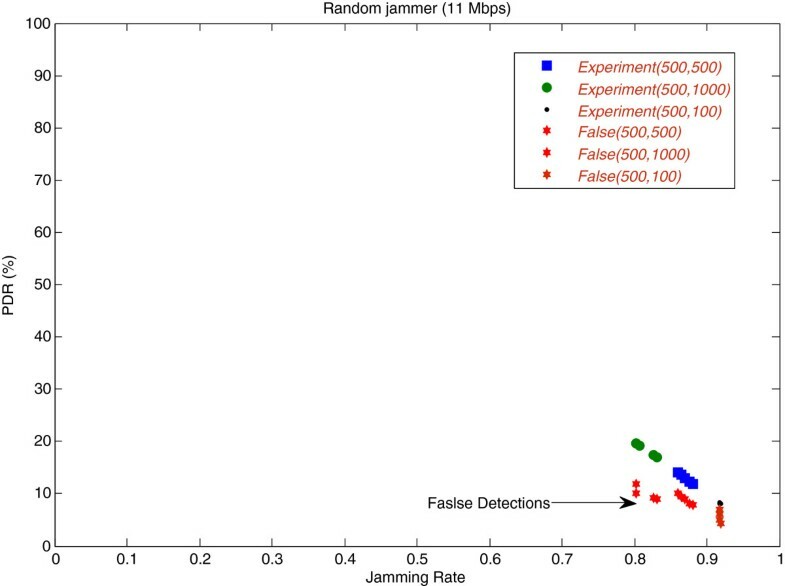 Detection probability and power usage by different jammers are discussed in . It shows that constant jammers have highest detection probability and highest power usage while intelligent jammers are best for their least detection probability and power usage. In , an optimal omniscient jammer is considered that jams ACK using probabilistic model. Moreover, it takes a pulse width of 22 μs to jam ACK at a rate of 1 Mbps. However, it is difficult to detect the transmission of ACK due to its very short length. Statistical correlation, a measurement between two random variables, is used to detect a jamming attack . In this case, the correlation strongly exists between error and correct reception time. The threshold is defined as the maximum value of slope that any couple of correlation coefficient and error probability (EP) could have. The relation in this correlation is checked with certain predefined EP and estimated threshold. If the relation is within the threshold, then it is considered non-jammed, or else, it is jammed. However, it works in case of reactive jammer that activates only when it senses activity on wireless medium. Fabricated CTS specifying certain amount of network allocation vector (NAV) duration time to jam the wireless channel has been discussed in . In this way, the malicious node forces its neighbors to keep quiet as long as specified in CTS packet’s NAV duration field. It investigates the adverse effects of such attacks on channel throughput and delivery ratio and proposes a simple method called address inspection scheme that uses two-hop neighborhood information. The main idea is to compare the destination field on the CTS frame with the neighborhood information. The targeted node sends a clear reservation (CR) message back to all neighbors, and all nodes reset their values to previous NAV values. However, it uses two-hop neighborhood information that all nodes must maintain using periodic ‘HELLO’ messages so that the freshness of information could be maintained. Also, the node getting the fabricated CTS message with its ID as targeting address sends back a CR message. Hence, there is a communication overhead in this technique. This technique also suffers from partial detection of a jamming attack, a portion of the network remains jammed, and other recovers from a jamming attack and works perfectly. Cell breathing is a new detection and recovery technique discussed in  not only for the case of jammers but also for normal network operations to increase the network throughput. This approach works for constant jammer detection only and not for protocol-aware jammers. It is based on the number of frames transmitted per total attempts of transmission. If the transmission attempts are above a predefined threshold, the node is considered jammed. After jammer detection, cell breathing is used to increase or decrease the transmission power of the access point so that the jammer may be kept away from the range of the access point. This not only helps in mitigating the jamming attack but also load balance the network throughput. Since the technique used in  suggests collection of large amount of data before analysis,  proposed a model-based jamming detection technique for wireless networks. Without prior knowledge of the network status, a head station can detect a jamming attack based on PDR observed for a certain value of SNR. However, it is hard to tell whether the drop in PDR is due to network congestion or high SNR value. It then suggested the network throughput as a measure of jamming detection. It shows that for the given values of SNR and probability of successful transmission, the rate of change of the network throughput first increases with the number of nodes in the network and reaches a peak value and then drops almost like a straight line. 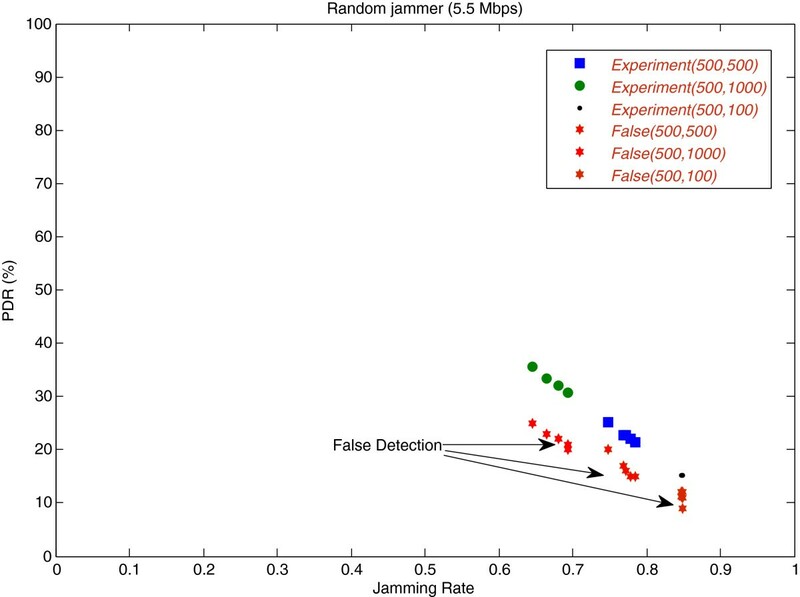 It used expected and observed throughput with marginal threshold values to detect jamming. However, this marginal threshold varies with network environments. Once the attack is detected, it uses a self-healing approach based on runtime channel allocation algorithm to dynamically assign the most optimal second channel with a best switching probability that minimizes transient time to stable state. However, this will work only for wide-band jammers where the number of channels with reasonable frequency separation is available. The idea of shot noise-based protocol-aware intelligent jamming that is presented in  is claimed to be the most energy efficient and with lesser probability of detection. In this technique, the jammer captures the NAV value of packet and hence transmission length. During the packet transmission, jammer sends a high-power pulse with enough width that corrupts enough bits so that FEC would be exhausted, checksum would not be passed at MAC layer and the packet drops ultimately. Since the sender would not get the ACK so it will retransmit the packet. In , the PDR is considered as the detection parameter and showed that PDR is 78% under normal network operation. However, effects of channel fading, poor link, and network congestion could be other causes of drop in PDR. Our proposed model of RF jamming detects the presence of the jammers and also to classify them. The model is based on multi-modal approach that incorporates PDR and signal strength as the detection parameters. The PDR is computed over the given sample window of time. Signal strength variation (ΔS) and PW are the model-specific parameters. 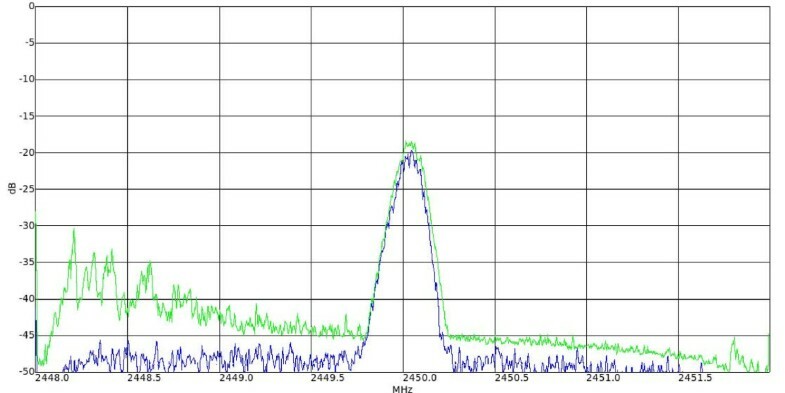 Signal strength variation (ΔS) is the change in signal strength taken in dB, i.e., (ΔS) = S Sobserved - S Snetwork, where S Snetwork is the signal strength achieved during training session without jamming and S Sobserved is the signal strength observed when the network is suspected to be under attack. PW is the measure of time for which (ΔS) is greater than the threshold value, and it is taken in microseconds. The jamming pulse acts as high-power Gaussian noise which can appear several times over the channel. To compute, N samples of channel’s received energy s (t) are collected. The collected samples thus form a bigger window of samples s (k), s (k - 1),.....,s (k - N + 1), taken at consecutive smaller sampling time windows. The detection is done using Equation 1. T(k) is the average jamming pulse observed for window of N samples. To decide the presence of a jammer, T(k) is compared with some threshold γ. The threshold γ is carefully computed to avoid false detection. The following are the relevant parameters collected by the detector in a given sample window of time to detect the jamming attack and its type: (1) PDR, (2) NAV value of each packet transmission, (3) ΔS, and (4) pulse width subject to ΔS > 0. Each packet on physical layer is composed of transmission symbols. These transmission symbols are composed of bits. The transmission time of each symbol is dependent on data transmission rate. Hence, we first compute the data rate and subsequently the transmission time of each symbol. This computation is particularly of interest to intelligent jammers. The above derivations are valid for a MAC frame with the size of 2,312 bytes . NAV value varies based on the packet size and the data transmission rate. 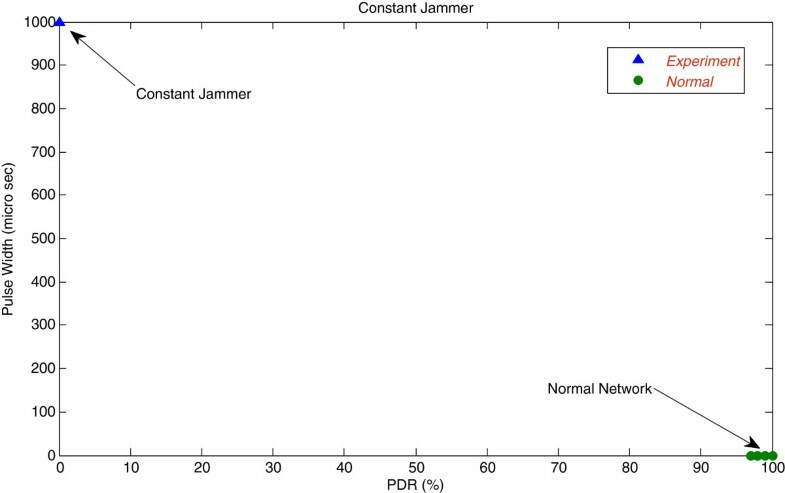 where Pj is the jamming probability computed for the different jammers in the subsequent sections and Pc is the collision probability of the packets when there are many transmitting nodes at the same time. Since, in our experiments, single transmitter and receiver are involved, Pc is always zero. However, it comes into consideration when the number of contending stations for the channel is more than one . where PW is the jammer pulse time and (PWi+1 − PW i ) is the sub-window time during which ΔS > 0. T is the total sample window time. Jammers are classified into two major classes: channel aware and channel unaware. (1) Channel-aware jammers continuously sense the channel and send jamming pulses when the packet is transmitted. (2) Channel-unaware jammers do not sense the channel before sending the jamming pulse and independently jam the channel irrespective of the transmission or not on channel. To model the behavior of both types of jammers, we take assumptions that the (1) transmitter is operating in saturated mode and the channel always have a packet on it. (2) For any PW of jammer, ΔS > γ for the pulse duration, where γ is the threshold defined in Equation 1.
where Nb is the number of data bits in each symbol and DR is data rate at which it is transmitted. where GI is the guard interval in two consecutive symbols. Guard interval is necessary to avoid intersymbol interference in two symbols. It is caused when symbols arrive at the receiver from two different paths. Multiplication with 2 is to ensure that TH should be enough to completely overlap the symbol in air. 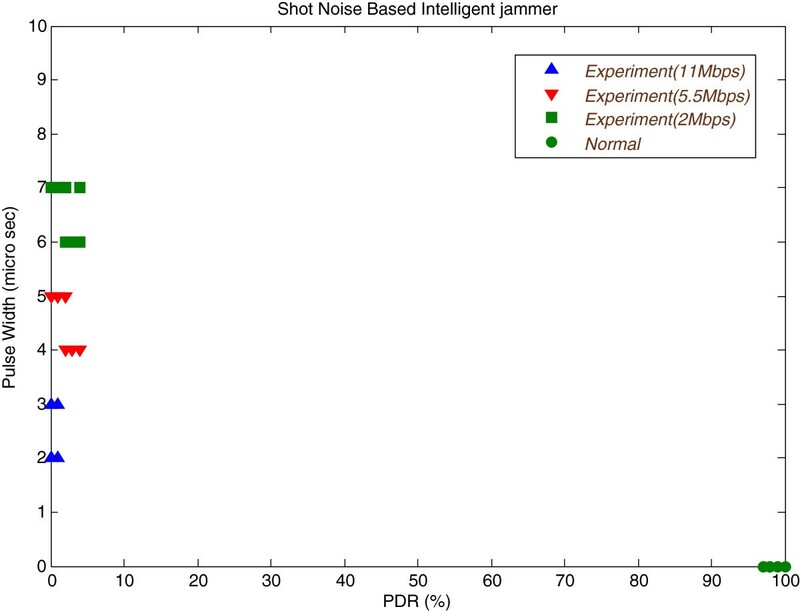 The difference in reactive and shot noise-based intelligent jammers is the PW. The shot noise-based jammers intelligently hit enough part of the transmission (data or ACK) such that the FEC scheme in the packet fails to recover the packet at the receiver side. Hence, with relatively lesser detection probability and higher energy efficiency, same jamming efficiency is achieved as that of the reactive jammer. where K is the number of effected packets and N is the total number of packets in the sampling window. Constant jammer: the jamming probability of constant jammer is one. This is because the fact that it continuously transmits random bits during the whole observation window, and the channel appears always busy to legitimate nodes for transmission. 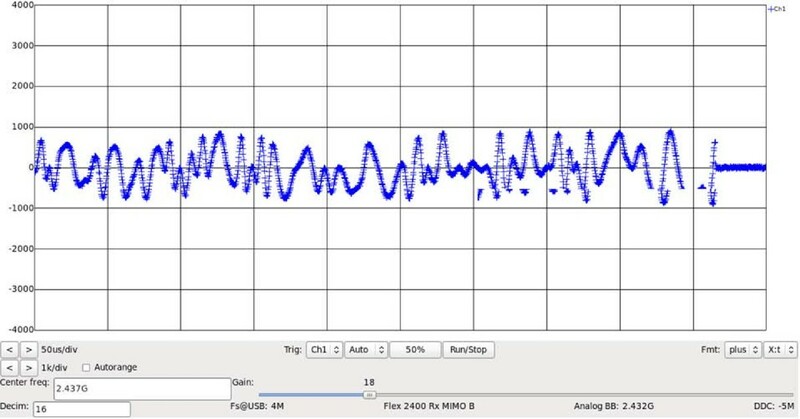 Random jammer: random jammers jam the channel independent of sleep and jam intervals of the transmission during a time window and behave exactly as constant jammer if sleep interval is zero during the time window. Consider a random jammer that acts as two-state continuous time Markov chain process as shown in Figure?1. It sleeps with exponential amount of time with mean 1 ? , where ? is the sleeping rate and jams the exponential amount of time with mean 1 µ , where µ is the jamming rate. The jammer jams and sleeps iteratively. Consider that the jammer is jamming initially at t = 0, what is the steady state probability that the jammer will be jamming or sleeping at time t? State transition diagram for two-state random jammer. Equations 15 and 16 provide a steady state probability for sleep and jam state. That is equivalent to Equation 15. Equations 15 and 16 give the probability of random jammer to remain in any of the two states. where Pj is the jamming probability computed for different jammers. The value of Pj for constant jammer is always one; PDR is always observed to be zero. The jamming probability for intelligent and reactive jammers is computed in Equation 10. For the random jammer that jams and sleeps for exponential amount of time, Equation 15 computes the steady state jamming probability. where Twin is the time of whole sampling window, X is the mean jamming pulse width observed for random jammer and σ is the threshold value around it. It is important to note that the selection of σ is a bit tricky, and it is dependent on the network. For example, in our experiments, we find that the drop in the PDR caused by the random jammer is 5.199% when the jammer is operating with Ts and Tj as [500,500] μs each at the DR of 2 Mbps. Therefore, we chose σ as 6%. We build a test bed for four jammers that are constant, random, reactive, and intelligent. The purpose of this prototype is to validate our analytical results with real-world experimental results. The test bed is based on Universal Software Radio Peripheral (USRP) and GNU Radio for jammer and detector . Four types of jammers are implemented on USRP. We observed the influence on PDR at detector under different jamming scenarios with different jamming parameters (PW, ΔS). Our experimental setup consists of four nodes: one as transmitter, one as receiver, one as jammer, and one as detector. The transmitter and receiver are connected via D-Link 2.4 GHz wireless router dl-514 (D-Link, London, England) with infrastructure mode. Both nodes are equipped with dwl-650 PCMCIA wireless cards (D-Link) that can operate on all four data rates of 802.11b. Both nodes have Fedora 12.86 (Raleigh, NC, USA) as the operating system with kernel 2.6. It automatically detects the wireless card driver. Installation and working of dwl-650 drivers can be seen at . The traffic between two machines is generated using PING utility with zero interpacket interval, and the size of each packet is kept as 1,024 bytes. Both the jammer and detector use Fedora 12.86 operating system and implements GNURadio-3.2.4 and USRP. 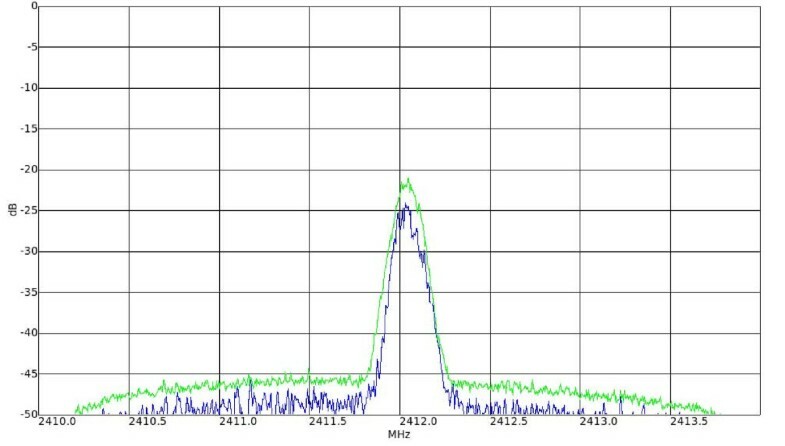 The USRP kit has RFX-2400 daughter boards of range 2,400 to 2,500 MHz and VERT-2450 vertical antenna (Ettus, Mountain View, CA, USA). The jamming models have been written in Python, Beaverton, USA. The detector machine has wireshark and a packet capture tool installed on it. Experiments are performed with different placements of all the four nodes. However, due to space constraints, all the nodes are placed in a circle of 1.5-m radius by placing the wireless router at the center of the circle and all other nodes at the circumference of the circle. The jamming node is preferred to be kept near the receiver to affect PDR. Ideal channel conditions are achieved by scanning the channel one by one for some time and pick up the one that is least affected from interference. Jamming pulse has the power ranging from 15 to 19 dB enough higher than the normal transmission. It is sufficient to corrupt the ongoing transmission. Algorithm 1 explains the detection sequence. The text for the conditional statements is kept italic, and the remaining algorithm is in regular text format. The PDR of a node is obtained using the method MeasurePDR(). It is then compared with the predefined threshold value thresh PDR. If PDR is lower than the threshold value, then the current signal strength variation ΔS is compared with signal strength variation ΔS in the normal network. Next is to check the PDR in consistence with ΔS using CheckPDRnSSvariation total PDR, ΔS. If it is found true that the symbol transmission time is obtained through GetSymbolTransmissionTime(), the packet transmission time is obtained through GetPacketTransmissionTime(packetLength) and the pulse width using GetObservedPulseWidth() methods. The obtained PW is then compared with its predefined values for constant, random, reactive, and protocol-aware intelligent jammers. The pseudocode of Algorithm 1 suggests that there are n statements. So the time complexity of the proposed algorithm is O(n). In this phase, we train the detector for different jamming scenarios. The transmitter sends the legitimate packets to the receiver. The jammer jams it depending on the jamming technique being employed at that time. The receiver, on the other end, captures the packets. That process is repeated for 120 s for each jammer. During this time, the set of the entire packet influenced through jamming is created. Meanwhile, the detector measures the variation in signal strength (ΔS) and also the PW. Based on the proposed multi-modal scheme, the area of occurrence of these parameters is determined for each type of jammer. Each detection area represents a type of jamming attack. This analogy helps in the detection of a jamming attack and classification. The PDR of each session is measured using Wireshark that acts as a packet capturing tool to capture packets received at the network interface. The CRC of the packet is checked on reception, and the packets with bad CRC are listed and dropped. PDR is then measured as the number of packets is correctly received to the total number of packets received. The impact of signal strength variation (ΔS) is discussed in Section 5.3. PW is dependent on the signal strength variation. Since the transmission power varies because of power fluctuations and external interference (Wi-Fi access point), signal strength variation threshold γ needs to be set. γ also depends on the distance between the jammer and the detector, transmission power of the transmitter, and the amount of external interference. Since pulse width is taken for signal strength variation above a predefined threshold γ at defined distance, the drop in PDR can be estimated. To validate the above argument, experiments are done for various jamming scenarios and the corresponding results are collected. We carried out multiple sessions for each type of jammer described in Section 2.2. As shown in Table 2, we measure the (1) PW for different types of jammers, (2) impact on PDR, and (3) variation in signal strength (ΔS) that is under normal and jammed scenarios by keeping the size of the packets as 1,024 bytes. For a given jammer type, each jamming session lasts for 120 s and the frequency is 2,450 MHz. The session is repeated for five times, and the average value is taken. SI c is the sleep interval of channel, and σ is the variation in pulse width observed. Figures 2, 3, 4, 5, 6, and 7 individually describes four jammers, and Figure 8 classifies four types of jammers and indicates the area where the type of jammer lies. In these figures, empirically gathered experimental results taken from test bed validate analytical counterparts. 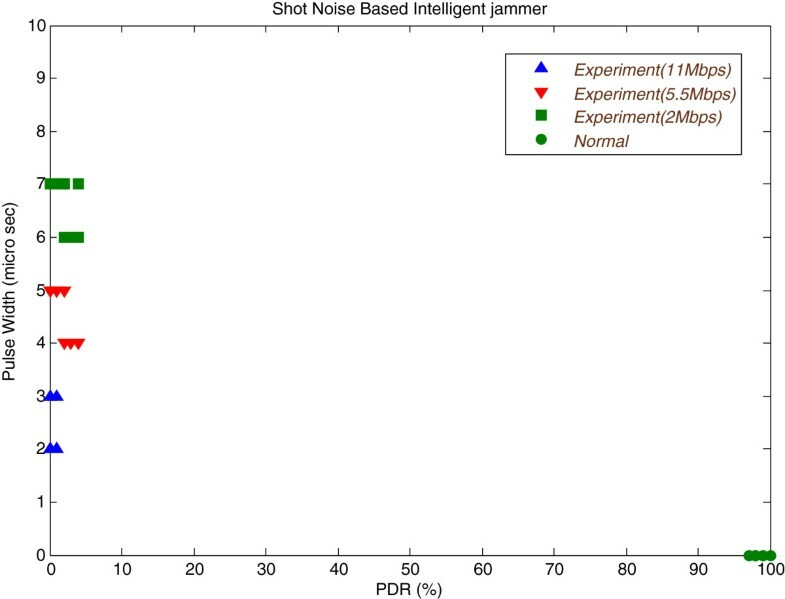 Figure 4 shows shot noise-based intelligent jammers where the TH is experienced lesser than that of our results. The reason for the increase in pulse width is channel coding robustness provided at different data rates. Another reason is the experienced throughput provided by commercial IEEE 802.11b wireless cards . The actual throughput experienced is around one-half of the one provided by the vendor. This is the reason of providing almost double jamming pulse to completely jam the packet. Detection of constant jamming attack. Detection of reactive jamming attack. Detection of shot noise jamming attack. Detection of random jamming attack (2 Mbps). Detection of random jamming attack (5.5 Mbps). Detection of random jamming attack (11 Mbps). Detection and classification of four jamming attacks. Figure 5 indicates that high jamming efficiency can be achieved with very small jamming rate, i.e., almost zero PDR for different pulse widths. It is to be noted that 802.11b does not have any FEC scheme at the physical layer . However, it uses different channel coding schemes for different data rates as shown in Table 3. The physical layer of 802.11b is quite robust against interference due to direct sequence spread spectrum (DSSS) and channel coding techniques like Barker sequence for 1 and 2 Mbps and complementary code keying (CCK) for 5.5 and 11 Mbps, still some packets with bad bytes pass to MAC layer. Since these packets cannot pass CRC check, hence these are discarded. It can also be inferred that the probability of packet drop increases/decreases with data rate, modulation , and coding techniques the transmission is using. It is also worth mentioning here that DSSS is relatively more robust than CCK because of 11 chips per bit that are spread on 22 MHz band. CCK uses 4 bits/8chips for 5.5 Mbps and 8 bits/8 chips for 11 Mbps. However, autocorrelation properties of CCK make it robust . The standard deviation of ten experimental values of pulse width and PDR is given in the first row of Table 4. Subsequent rows provide variation in the standard deviation for the mean value of pulse width and PDR for the given jammer at a data rate of 2 Mbps. Table 4 indicates the variation in the standard deviation. It is observed that the standard deviation of all four jammers differs significantly as indicated by the first row of Table 4. The impact on standard deviation for different jammers is shown in row 2 to row 5. It is computed if the mean value of pulse width and PDR for any other jammer under consideration is provided. It is observed that the first two columns of the last row do not show significant variation from the standard deviation value of constant and random jammers, respectively. Here, the pulse width of the different jammers is used as a classification parameter. Reasonable estimates of PDR variation are required for random jammers. We developed a random jammer that operates in jam and sleep intervals iteratively. Jam and sleep rates follow exponential distribution and generate pseudorandom numbers around given jam and sleep rate. Table 5 indicates the maximum PDR variation from the mean value for the given (jam, sleep) rate at a specific data rate. It is important to characterize the signal strength variation and false detections for accuracy assessment. The term baseline power is the power that the detector observes when no jamming activity on the channel is under observation. This is the power observed when there is no transmission or transmission on the channel. Different scenarios with multiple parameters are created to characterize ΔS and impact of distance. The experiment is done with single jammer and detector in the scenario. The distance in the jammer and detector varies from 1 to 2 m. The impact on signal strength is shown in Table 6. The impact on signal strength variation with distance can be seen from Figures 9, 10, and 11. Signal strength variation at 1 m.
Signal strength variation at 1. 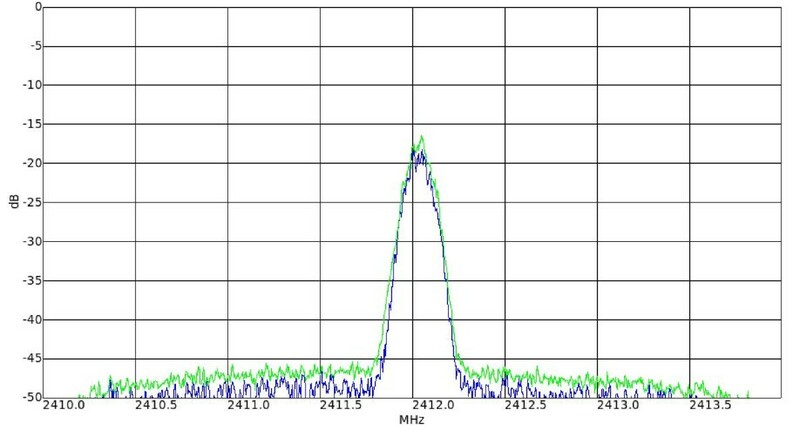 5 m.
Signal strength variation at 2 m.
The experiment is performed with one legitimate packet generator connected to the access point. The jammer and detector are placed at a distance changing from 1 to 2 m. The results are shown in Table 7. It is important to observe in Table 7 that the baseline power alleviated from -35 to -32 dB for the distance of 1 to 2 m, respectively. The baseline power is actually the transmission power observed at the channel. Hence, ΔS reduces from 18 to 8 dB as the distance increases from 1 to 2 m. This indicates careful selection of threshold γ to differentiate jamming from false detection for variable distance. In this scenario, only the detector machine is active. It is created to observe the average number of power fluctuations and external interferences in a given window of time. The average pulse width time for fluctuations is also observed. The results are shown in Table 8. Figure 12 shows the pulse width spectrum. It is taken at the detector machine during point-to-point transmission session. Pulse width monitoring during training session. Table 8 shows that PW, because unintentional external interference, is enough to drop an 802.11b packet at supported data rates. It is important that ΔS is small. Many commercial wireless NICs have adaptive transmission power and treat such ΔS as noise. It is important to characterize the intentional jamming attack from unintentional high-power noise interference. To produce external interference, a microwave oven operating at 2,450 MHz is used. The oven is operated for 10 s during each monitoring session. Table 9 shows the spectrum change results when no jammer activates, and Figure 13 shows the spectral changes. Table 10 demonstrates the statistical results in the presence of a jammer. The spectral changes in the presence of high power external interference. ΔS in Table 9 is found to be close to ΔS due to a jammer in a given scenario. Since the external noise source acts as a constant jammer during activation time, it is difficult to classify the drop in PDR due to the constant jammer or external noise source. 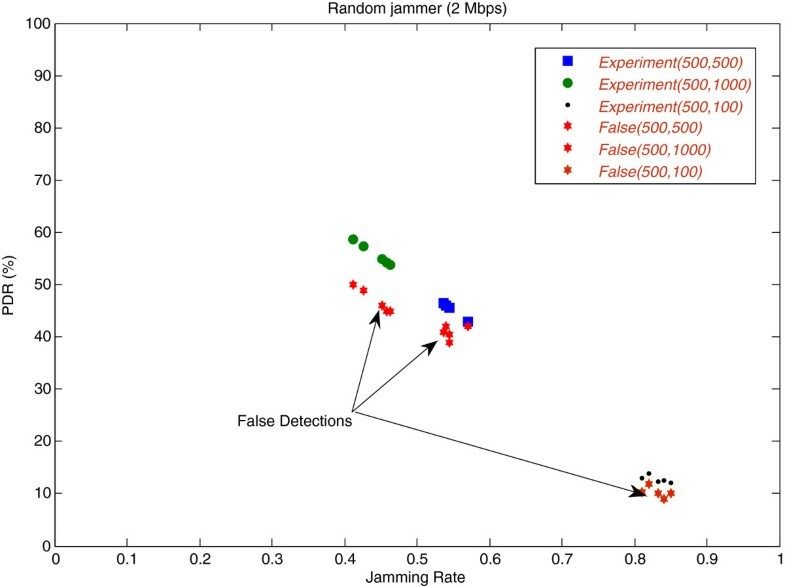 For random jammers, false detections are shown from Figures 5, 6, and 7. The impact of high-power external noise on PDR of random jammer is shown in Table 11. It is evident that false detection rate increases with an increase in the high-power external noise operating at a distance for which ΔS ≤ γ. The major contribution of the work is the classification of jamming attacks with accuracy and low false alarm rate. Instead of performing simulations, a real test bed is developed for launching different jamming attacks with software-defined radio on USRP. Similarly, the detector node equipped with USRP and Python scripts collected the readings. The experimental results are cross verified with analytical results. This multi-modal detection scheme not only enhanced the accuracy of detection but also provided the classification of jamming attacks. It takes into account that PDR, signal strength variation, and pulse width yield results that comply with experimental results. The proposed mathematical model is an attempt towards solid foundation for the classification of jamming attacks. Moreover, the experiments are done with single transmitter and receiver. It is extensible for more than two nodes to monitor the PDR and signal strength variation of transmitting nodes. 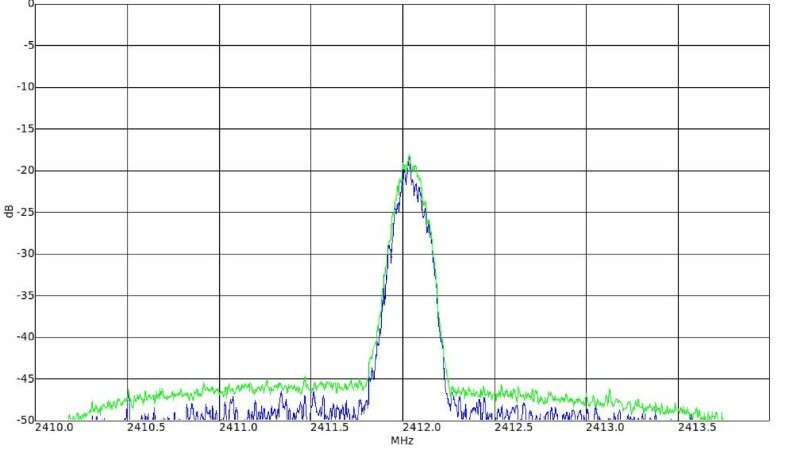 Signal strength variation becomes complex when more than two transmitting nodes and a jammer are present on the channel. To study the change of power levels in the presence of multiple stations and jammers, there could be another dimension for study. Another aspect is to mathematically model the collision probability and extend the equations that compute PDR. IEEE 802.11 g/n are not addressed in this paper. However, this work can be extended for these protocols.